Is Dominion Energy, Inc. (NYSE:D) A Good Stock To Buy? Is Dominion Energy, Inc. (NYSE:D) a good investment right now? We check hedge fund and billionaire investor sentiment before delving into hours of research. Hedge funds spend millions of dollars on Ivy League graduates, expert networks, and get tips from investment bankers and industry insiders. Sure they sometimes fail miserably but historically their consensus stock picks outperformed the market after adjusting for known risk factors. Dominion Energy, Inc. (NYSE:D) was in 37 hedge funds’ portfolios at the end of December. D has experienced an increase in hedge fund sentiment recently. There were 27 hedge funds in our database with D holdings at the end of the previous quarter. 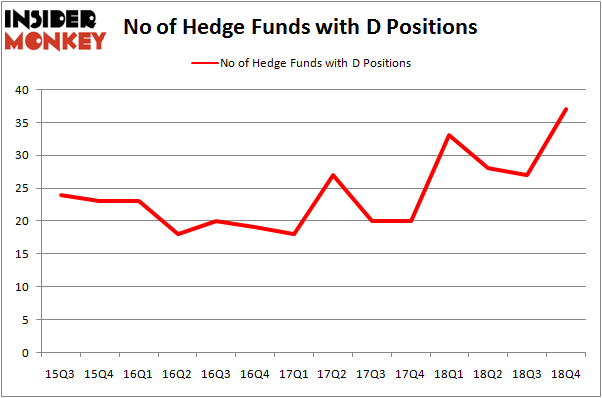 Our calculations also showed that D isn’t among the 30 most popular stocks among hedge funds. Let’s take a peek at the latest hedge fund action surrounding Dominion Energy, Inc. (NYSE:D). What does the smart money think about Dominion Energy, Inc. (NYSE:D)? At the end of the fourth quarter, a total of 37 of the hedge funds tracked by Insider Monkey were bullish on this stock, a change of 37% from one quarter earlier. Below, you can check out the change in hedge fund sentiment towards D over the last 14 quarters. So, let’s examine which hedge funds were among the top holders of the stock and which hedge funds were making big moves. The largest stake in Dominion Energy, Inc. (NYSE:D) was held by Millennium Management, which reported holding $244.3 million worth of stock at the end of September. It was followed by Luminus Management with a $139.3 million position. Other investors bullish on the company included Citadel Investment Group, Zimmer Partners, and D E Shaw. As one would reasonably expect, key money managers have been driving this bullishness. Point72 Asset Management, managed by Steve Cohen, established the most valuable position in Dominion Energy, Inc. (NYSE:D). Point72 Asset Management had $53.7 million invested in the company at the end of the quarter. 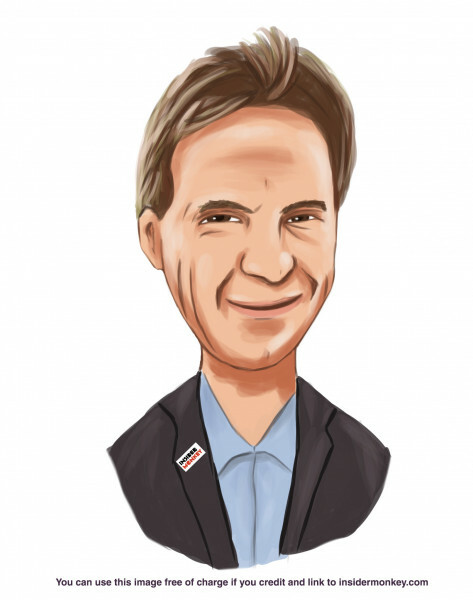 Clint Carlson’s Carlson Capital also made a $42 million investment in the stock during the quarter. The other funds with brand new D positions are Jos Shaver’s Electron Capital Partners, Sara Nainzadeh’s Centenus Global Management, and Paul Tudor Jones’s Tudor Investment Corp.
Let’s go over hedge fund activity in other stocks – not necessarily in the same industry as Dominion Energy, Inc. (NYSE:D) but similarly valued. These stocks are Honda Motor Co Ltd (NYSE:HMC), General Dynamics Corporation (NYSE:GD), The Bank of New York Mellon Corporation (NYSE:BK), and Occidental Petroleum Corporation (NYSE:OXY). This group of stocks’ market caps resemble D’s market cap. As you can see these stocks had an average of 26.75 hedge funds with bullish positions and the average amount invested in these stocks was $3115 million. That figure was $1042 million in D’s case. General Dynamics Corporation (NYSE:GD) is the most popular stock in this table. On the other hand Honda Motor Co Ltd (NYSE:HMC) is the least popular one with only 13 bullish hedge fund positions. Dominion Energy, Inc. (NYSE:D) is not the most popular stock in this group but hedge fund interest is still above average. This is a slightly positive signal but we’d rather spend our time researching stocks that hedge funds are piling on. Our calculations showed that top 15 most popular stocks among hedge funds returned 19.7% through March 15th and outperformed the S&P 500 ETF (SPY) by 6.6 percentage points. Unfortunately D wasn’t in this group. Hedge funds that bet on D were disappointed as the stock returned 9.2% and underperformed the market. If you are interested in investing in large cap stocks, you should check out the top 15 hedge fund stocks as 13 of these outperformed the market. Do Hedge Funds Love Diageo plc (DEO)? Were Hedge Funds Right About Buying Costco Wholesale Corporation (COST)? Were Hedge Funds Right About Dumping Twenty-First Century Fox Inc (FOX)? Hedge Funds Have Never Been This Bullish On Thermo Fisher Scientific Inc. (... Were Hedge Funds Right About Buying United Technologies Corporation (UTX)? Itau Unibanco Holding SA (ITUB): Are Hedge Funds Right About This Stock?